Our very own Katie Ziegler from Tech Services has put together a great display that you can find at the entrance to the library. The materials in this collection were donated to the library in 1986 and have been stored since then. These materials are now seeing the light of day once more, and we invite our community to come and view them. Mourlot Studios, located in Paris, France, was known as the largest producer of artistic posters in the 1930s. It was also known to invite prominent artists to work on location within the studio to create original works which they then produced. This particular collection, put together by the Studio’s founder Fernand Mourlot, includes prints from 25 original lithographs created at the studios by artists such as Miro, Matisse, and Picasso. This original edition is comprised of loose leaves while later editions were bound. Although this copy is number 270 of the 800 that were printed, only five libraries in the world are listed as owning one. Out of those five, this is the only copy in a United States library. This work was donated to Berea College Hutchins Library by Thomas L. Hill and Dr. Kathleen Kulp-Hill, a professor of Spanish at EKU, in 1986 and now resides in the Special Collections Curio section. The display is free and open to the public. You can view it during regular library hours. Our display of the St. John’s Bible at the library is almost ready to go. As you walk into Hutchins Library, you may have noticed work on a new display. There is a new wooden display case as you walk in. Banners are up now. 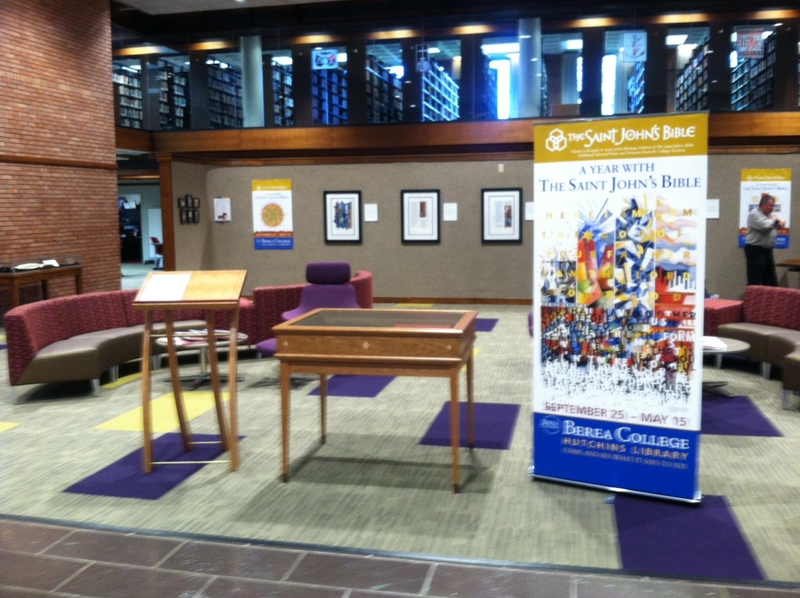 The library is preparing to display Volume 6, “Gospels and Acts” of the Heritage Edition of the St. John’s Bible. What is the St. John’s Bible? What if the Bible clearly depicts Adam and Eve, the first humans, as East African? What if the views of Earth from space are borrowed from NASA’s Hubble Telescope? What if the great religions of the world, in addition to Christianity, are referenced wherever possible? Come explore the answers to those questions and more as you view and spend time with the St. John’s Bible at Hutchins Library. The event opens with a public showing at campus convocation on Thursday, September 25, 2014 at 3:00pm in Phelps-Stokes Chapel. The convocation features Tim Ternes speaking on “More Work Than We Knew, More Joy Than We Imagined.” He will describe the 13 year process of creating the first Biblical manuscript commissioned in more than 500 years. After September 25, the display will continue at Hutchins Library until May 15, 2015. In addition to the display, the library and the college will host a variety of programs related to the St. John’s Bible throughout the campus and the community. Check out the activities calendar for details. Also, Hutchins Library Special Collections and Archives will feature an exhibit of other rare manuscripts, early printed Bibles, and sacred texts from the college’s collection. The Bible is a work with fans and detractors. Some see it as the Word of God. Others may see it as a great work of literature and storytelling. Others yet may see it as words often misused and misrepresented, a work partly responsible for historic challenges including slavery, conflict and war, and enabling human exploitation of the planet and other people. Whatever your view, this is an exhibit for all, religious and non-religious. Join us and come see what the St. John’s Bible has to say to you. The convocation on September 25, 2014 is free and open to the public. The display at Hutchins Library can be viewed during the library’s regular hours. “A Year with the St. John’s Bible” at Berea College is made possible through a partnership between Hutchins Library and the Campus Christian Center. with support from the Art, General Studies, History, and Religion programs. 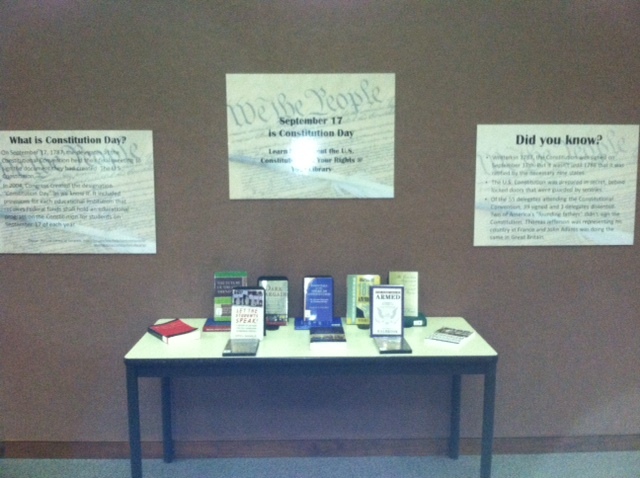 The library is currently featuring two book displays from September to the middle of October, 2013. Books on the displays are available for check out, so if you see something you like, feel free to pick it up, take it to our Circulation Desk, and check it out. Don’t worry. We’ll be happy to put another book in its place. First we have “From Our Shelves. 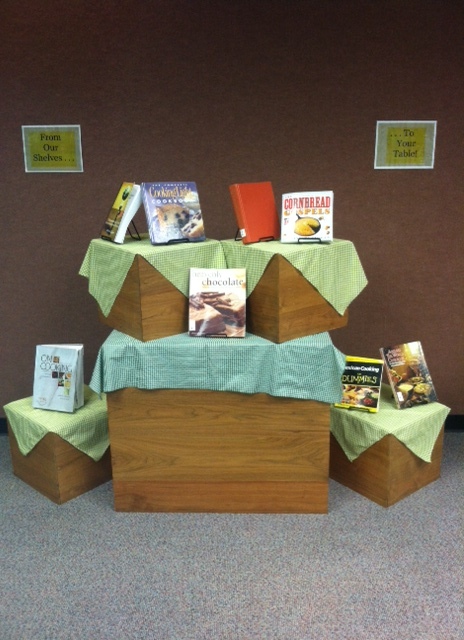 . . to Your Tables.” This display highlights some of our cookbook library holdings. With fall season now here, I am sure many will look for some recipe ideas for the chilly days to come. The following books are currently on the display, which is located on the second floor of the library, near the seating area next to the reference collection. Around the World Cookbook. Call number: 641.59 A771. Brill, Steve, The Wild Vegetarian Cookbook. Call number: 641.563 B857w 2002. Chesman, Andrea, The Garden-Fresh Vegetable Cookbook. Call number: 641.65 C524g 2005. Crescent Dragonwagon, The Cornbread Gospels. Call number: 641.815 D759c 2007. France, Christine, Heavenly Chocolate: Divinely Decadent: The Ultimate Cookbook. Call number: 641.637 F815h. Labensky, Sarah, On Cooking: a Textbook of Culinary Fundamentals. Call number: 641.5 L116o 2007. Mario, Thomas, The Midnight Cookbook. Call number: 641.5 M341m. Milliken, Mary Sue, et.al., Mexican Cooking for Dummies. Call number: 641.59 M654m 1999. Nichols, Nell, Farm Journal’s Homemade Snacks. Call number: 641.563 N621. Smith, Margaret Ruth, The Blender Cookbook. Call number: 641.5 S655b. Stern, Jane and Michael, Square Meals: a Cookbook. Call number: 641.5 S839s 1984. 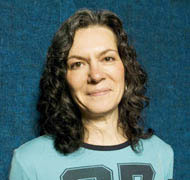 Wessler, Kathy, The Complete Cooking Light Cookbook. Call number: 641.563 C737. Witty, Helen, Better than Store-Bought. Call number: 641.5 W832b. Zanger, Mark, The American Ethnic Cookbook for Students. Call number: 641.59 Z29a 2001. Abramson, Paul, et.al., Sexual Rights in America: the Ninth Amendment and the Pursuit of Happiness. Call number: 342.7308 A161s. Berkowitz, Peter, Terrorism, the Laws of War, and the Constitution: Debating the Enemy Combatant Cases. 343.7301 T328 2005. Carey, George, In Defense of the Constitution. Call number: 342.7302 C273i. Dautrich, Kenneth, et.al., The Future of the First Amendment: the Digital Media, Civic Education, and Free Expressions Rights in America’s High Schools. Call number: 342.7308 D244f 2008. Goldstone, Lawrence, Dark Bargain: Slavery, Profits, and the Struggle for the Constitution. Call number: 342.7302 G624d 2005. Gunn, Jeremy, No Establishment of Religion: America’s Original Contribution to Religious Liberty. Call number: 322.109 N739 2012. Halbrook, Stephen, That Every Man be Armed: the Evolution of a Constitutional Right. Call number: 344.7305 H157t 2013. Hamm, Richard, Shaping the 18th Amendment: Temperance Reform, Legal Culture, and the Polity 1880-1920. Call number: 344.7305 H224s 1995. Hudson, David, Let the Students Speak! : a History of the Fight for Expression in American Schools. Call number: 342.7308 H885L 2011. Madison, James. Writings. Call number: 973.3 M182w. Richards, David, Women, Gays, and the Constitution: the Grounds for Feminism and Gay Rights in Culture and Law. Call number: 342.7308 R514w. Wasby, Stephen, Essentials of the American Constitution: the Supreme Court and the Fundamental Law. Call number: 342.7302 S544e. Wooton, David, ed., The Essential Federalist and Anti-Federalist Papers. Call number: 342.7302 E786 2003. Book links go to BANC, our library catalog; all books are usually located on the library’s third floor unless otherwise noted. And don’t forget that our Presidential Inaugurations of Berea College display is still up in the second floor of the library. So stop by and check out our displays. As always, if you have any questions or comments, you can comment here on our blog, or you can stop by our reference desk.